I'm sure most of you have seen this co-sleeping ad which has been all over the internet recently. 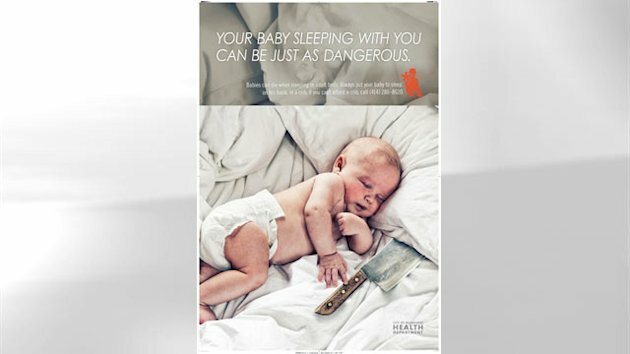 Basically the ad is stating that co-sleeping or bed sharing is just as dangerous to your baby as if they were to sleep next to a knife. I feel like the people who created this ad are very misinformed on bed sharing and that when done safely can be such a wonderful thing. We share our bed with Chloe and have been doing so since she was about a month old. We as a family love it, Chloe feels safe, we feel safe having her so close to us, and I am able to attend to her needs quickly. Not everyone is going to want to bed share, and that's totally fine but if you are going to bed share it's very important to do it safely. :: The baby in the ad above is sleeping on its side rather then its back. :: The bed looks to be very soft and the sheets and comforter look to be very fluffy and heavy. :: The baby's head is resting on a pillow. Bed sharing is not for everyone but if it is something that you are interested in please do your research and practice safe bed sharing. Nothing is more important then the safety and well being of your baby! Very good points. We wish we could with Lillian, but our bed is just way too high off the ground and we have a huge gap where the mattress meets the headboard. Too risky on our bed! I am envious you guys are able to tho! Rachel, ya that makes sense why you wouldn't want to do that with the bed you have. I only wish we had a king size bed instead! Amen! It can be completely wonderful when done safely. Ah! I've seen this ad before. It makes me so mad. Ignorance! We co-sleep too and there is a major lack of education on this topic. I will write about this topic in the future too, thanks for sharing the facts! Melanie, I totally agree, its sad. I'm excited to read your post on co-sleeping!! And your welcome!